Independent London based filmmakers, Andy Collier and Tor Mian, have released their unsettling trailer for feature horror film "Charismata", which looks at the impact of female oppression in the world of a Satanic murder case. When Detective Rebecca Faraway is thrown head first into a cult murder case, she finds the male-dominated world forces her into obsession and suspicion. As the case develops and her instincts are ignored by those around her, paranoia combined with hysteria and delusions transcends into a demonic game of cat and mouse between her and the enigmatic suspect Michael Sweet. Divulging deeper into Faraway’s delicate mind, the main suspect shows her that death is merely the beginning of what could be the struggle to keep her soul and sanity. Sarah Beck Mather (Rebecca Faraway) has been credited notably for her incredible performance in Charismata, alongside Jamie Satterthwaite (Michael Sweet); who together build a disturbing and manipulative relationship. Charismata also stars Andonis Anthony who plays Faraway’s sarcastic and crude-humoured partner Detective Eli; and Johnny Vivash who portrays the hapless and illequipped security manager who is another suspect. 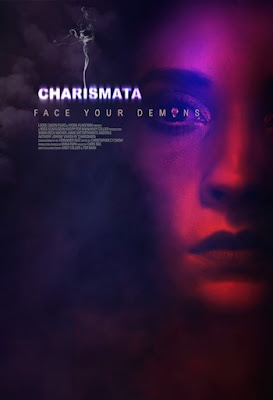 The release date of Charismata and the distribution company are yet to be confirmed. The horror feature is the first film that Andy and Tor have cowritten and co-directed together, with it also being Andy’s first feature as director. Tor and Andy previously worked on the highly acclaimed micro-budget features The Sky in Bloom and The Milky Way, both which were written and directed by Tor Mian.